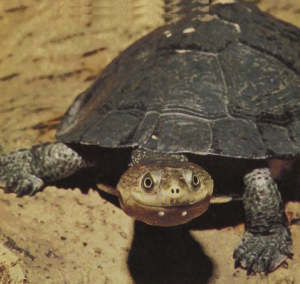 This is one of some half-dozen side-necked turtles of Africa, the classification of which is still confused. Since this turtle resembles many other aquatic turtles in the drastic changes in its body proportions and coloration during growth, it is difficult to identify the several forms. Consequently, it will be some time before we know how many species there actually are in this genus. The present species supposedly ranges from Senegal in extreme Western Africa across the continent to the island of Zanzibar and even to Madagascar. These small to medium-sized turtles (shell length 11 Ti inches) are found in streams and permanent ponds, as well as in the pans or seasonal waterholes that promote game concentration in the high plains country. They are good swimmers and omnivorous, predating and scavenging.